Mansion for the 2019 Morristown High production 'The Addams Family.' Photo by sophomore Alex Fisher. 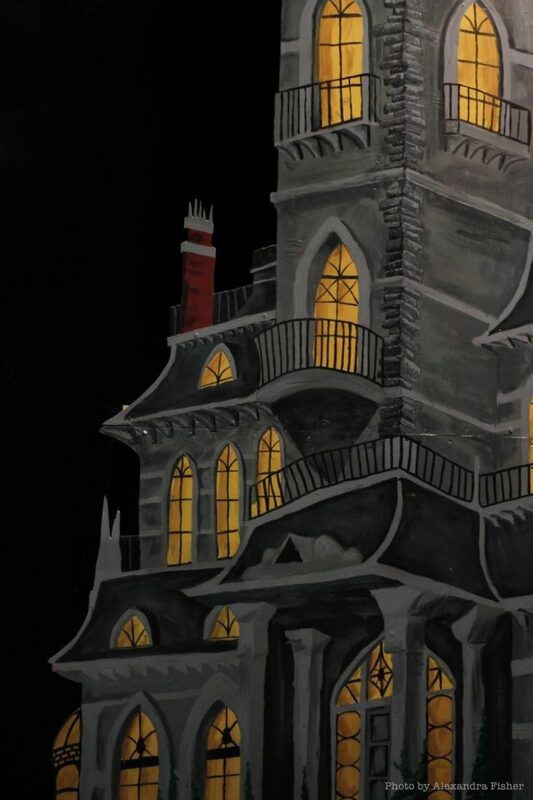 This week’s Morristown High School production of The Addams Family showcases a wide range of acting, singing, and set design talents, infused with a generous helping of humor. Junior Grace Keane paints set piece for the 2019 Morristown High production ‘The Addams Family.’ Photo by sophomore Alex Fisher. Bringing the classically creepy family onto the MHS stage has been a labor of love for the extensive team; it’s been no easy task turning a high school auditorium into a macabre world of frights and delights. and lighting director, students have worked to craft a spooky ambiance. Senior Loren Kennedy, master carpenter for the 2019 Morristown High production ‘The Addams Family.’ Photo by sophomore Alex Fisher. This quest for extraordinary results has prompted the theater department to introduce technologies and techniques never before seen on the MHS stage. The team constructed especially large set pieces to adorn and flank the stage, illuminated by professional-quality, state-of-the-art lighting. Scenic artists Wanda Ardila (Grade 12) and Maggie Sullivan (Grade 10) incorporated multi-step finishing techniques to enhance the production’s sense of realism. Together, these strategies aim to present one of the most exciting arrays of visual effects of any MHS musical to date. Creating something out of nothing, starting with nothing but piles of wood and fabric, is a massive undertaking, especially when it comes with the added pressure of being displayed for family, friends and peers in the community. Sophomore Henry Annis mans the drill for the 2019 Morristown High production ‘The Addams Family.’ Photo by sophomore Alex Fisher. Learning through action is a powerful experience for students. In keeping with the mysterious spirit of the show’s protagonists, Hession promises special scenic surprises for those bold enough to visit the Morristown High School auditorium this weekend. Nicholas Voltaggio is a member of the Morristown High School class of ’21.